READ, READ READ! There are countless ways to engage with books over the summer break and taking the time to sit down and enjoy their content is reward enough ... HOWEVER... If your child would like to take advantage of these summer reading incentive programs then their summer reading "for fun" can turn into free books or even gift cards! Take a look at these links below, and know that these programs are available throughout the summer at no cost for our Barton Hills Eagles. Enjoy and Happy Reading! Need to read but don't have a book? NO PROBLEM! The Barton Hills Library has you covered :). Get FREE access to over 10,000 e-books anytime, on any electronic device! Go to the tab at the top of this page that says "E-BOOKS". All the login information is there for you. Have fun. Note: this page, and the rest of the website, is password protected. Some of the resources within are for BHE students only, therefore the content is not made public. Contact Ms. Ewing, your child's teacher, or reference the PTA newsletter for the password if your student has forgotten it. Thank you for understanding. 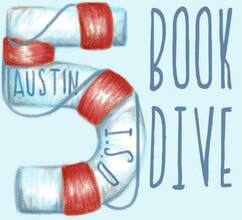 AISD's 5 Book Dive summer reading program! How do I complete the AISD 5 Book Dive Summer Reading Program? Step 1: Write down the 5 books you read on the back of the 5 Book Dive bookmark. Step 2: Have your parent / guardian sign the bookmark. Step 3: Bring the completed bookmark to the BookPeople store. BookPeople will stamp your bookmark and give you a $5.00 gift certificate! That’s it! Then, you can either keep the bookmark for yourself (to remind you of a job WELL DONE!) or you can turn it in to Ms. Ewing to put up in the Barton Hills library! (One offer per child for the summer). Way to go readers – dive right into summer reading! BookPeople 5 Book Dive Bookmark for a $5.00 Gift Certificate! Book lists - what Else can you read over the summer?! Texas Library Association Book Lists Below are links to books that are on lists put out by the Texas Library Association. These are important to us at Barton Hills because we participate in voting for the Bluebonnet Book winner! Peruse the links, they will navigate you directly to the TXLA website, or a PDF document. A brief description of what the list is all about will accompany the list. These lists are suggestions from a fantastic resource - however, do know that these lists are SUGGESTIONS and not REQUIRED reading. As always, preview the selection first to ensure it is the right fit for your family. ﻿ There are so many wonderful resources and lists out there! I have found success in the past using one of my go-to resources as a classroom teacher: Bank Street College of Education in New York City. These lists are suggestions from a fantastic resource - however, do know that these lists are SUGGESTIONS and not REQUIRED reading. As always, preview the selection first to ensure it is the right fit for your family. Book List Grades Pre-K through K - this is called "Lower School"
Book List Grades 1st through 4th - this is called "Middle School"
Book List Grades 5 through 8 - This is called "Upper School"